Outside of day-to-day responses to articles and messages, how often do you take a step back and look at the larger picture of your FB strategy? Listening on Facebook is more strategic than just the typically, reflexive, review and respond, social media practice. It’s used by companies around the world to understand their own customers better and inform their own next marketing step. When you pair both monitoring plus listening tools, you find trends which you might not have noticed before. Each system is different, though, so your listening technique should be customized per network. Facebook listening is basically the process of digesting all of the information you’re given on Facebook, likes, remarks, recommendations and private messages, and identifying trends in the activity. It’s an active analysis of your passively gathered data. Listening gives you a clearer viewpoint of how customers feel about you (brand perception), to help shape your next or existing advertising campaign. You rule out anomalies, which may be absurd comments, trolls, and near-do-well diatribes, and find the underlying message in the greater balance of the overall engagement that you can work with. Facebook monitoring is similar to typical social monitoring but with less flexibility. Due to privacy issues and API limitations, Facebook limits the types of data it provides to third-party apps. On Twitter, you can conduct and save search criteria. But on Facebook, it’s more difficult. A myriad of private and closed groups, private messages and billions of posts a day makes it impossible to compile all of the search results. So what should you monitor? As a brand, you should review your own Messenger activity, public posts, comments and interactions in related industry Groups. If there are regular or periodic press releases, you can check on how well they perform with a service like Buzzsumo and it’s Content Analyzer. Understanding your goals and how they play into your Facebook monitoring is essential. If Facebook is used as a default customer service platform then you should focus your monitoring activities around customer comments, service issues and complaints. If your customer base isn’t aware that Facebook isn’t their customer service portal, make sure to monitor other assets online to cover your base. 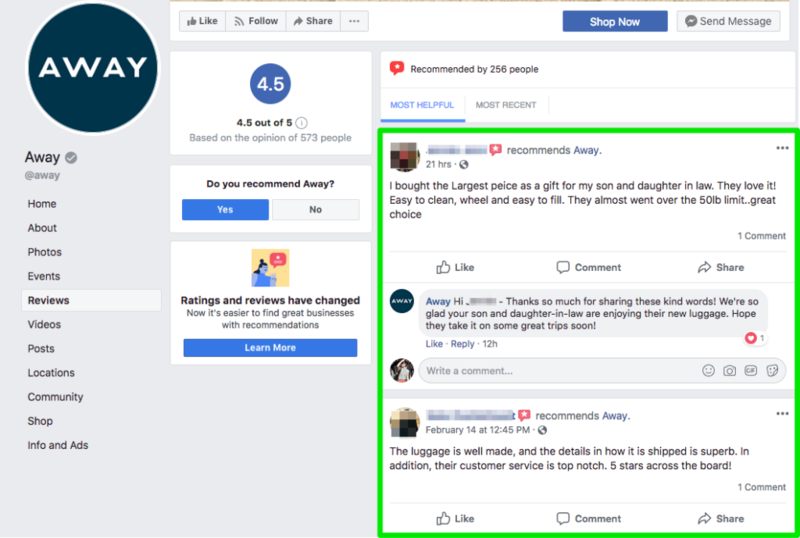 An example of using another asset is using Facebook’s recommendations feature to collect reviews. After you release a new product that for the sake of our conversation is a “reliable”, reviews are sure to follow. Monitoring would be reading the reviews and possibly responding to each review and thanking them. Listening would be noticing complimentary language using the description “reliable,” and then taking action to incorporate the products reliability into the marketing assets. While Facebook monitoring is a more reactive process, Facebook listening is proactive whereby the intel gleaned is inserted into the marketing. Starting a Facebook listening strategy includes the same first steps as any network. You begin with setting up your tools and understanding your goals. Why are you using a listening strategy and what do you hope to learn? If you’re brand new to this, we recommend setting up monitoring as a first step and then seeing what kind of information you gather. 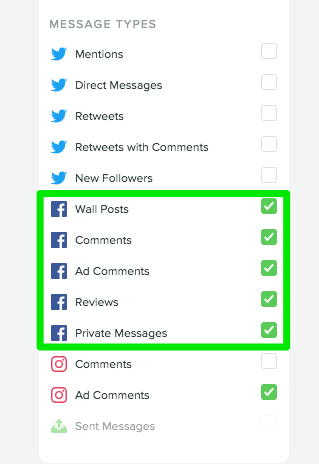 SproutSocial.com has a listening solution that definitely needs some looking at. 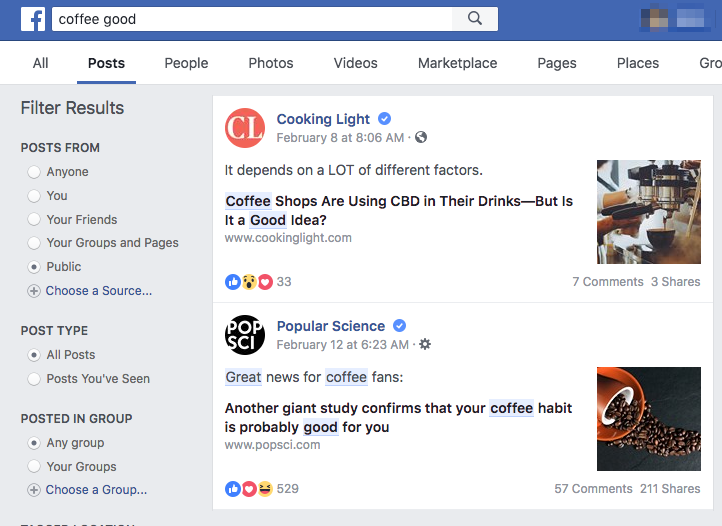 Native search in Facebook offers you the top posts for your terms and should be one of several listening posts (so-to-speak) in your listening arsenal. For example, searching for your brand, industry related terms and competitors is a good use of the search function. You can narrow these results down to those that you follow, any Group, any location and any date. Finally, to set up a monitoring strategy on Facebook to track your competitors, navigate to Insights, Overview and then to Pages to Watch. 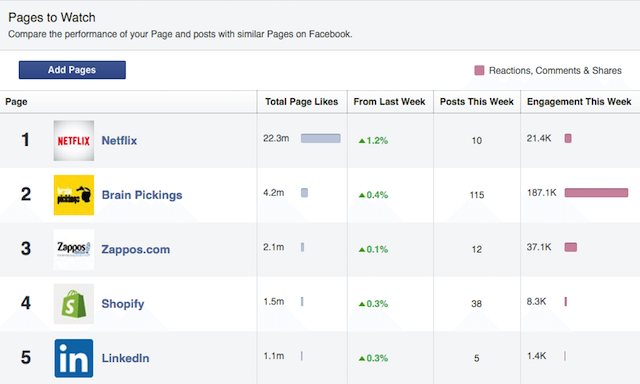 Here, you track Pages in your industry or of your competition to see how their weekly posts are performing. Watching these trends could help you think of new ways to reach your own customers. After you set up your monitoring, schedule time in your calendar to review all of the data. It can be done at your monthly or quarterly reports review. Unless you’re analyzing a short campaign, a daily or even weekly review may not provide enough information to analyze. Let’s take a look at how other companies are using social listening for Facebook. With the below examples, you’ll hopefully take away some actionable ideas for your own company. Each brand uses social listening differently. Some may use it to inform a product feature while others might also use it for customer sentiment. Social listening isn’t an either/or scenario. In the retail sector, Samsung looks at their competitors to see what their most common complaints are. In its launch of the new Galaxy S9, the company posted a series of videos highlighting the differences between the Galaxy and the Apple iPhone X. The videos are sarcastic and funny, with each one focusing on one feature that Apple customers often complain about. The style is much like a comedy skit and short for maximum impact. In this example, Samsung used listening on their competitors to inform their campaign strategy by tracking down commonly voiced complaints about the competitor product. Noticing trends in your own industry and developing products to go with them is a natural part of a company’s growth model. Burt’s Bees saw face masks on the rise and developed their own version that fits their brand. Product research was conducted through social listening of competitors and internal analyses of what customers wanted out of them. The result was a set of new face masks responding to the problem areas that customers most wanted to fix. Cool Whip and Jell-O are both owned by Kraft. But they serve slightly different audiences. While campaigns for both are targeted to adults or those with buying power, Jell-O is more fun for kids. Kraft used social listening to understand what each of these brand’s customers want and target their products accordingly. Even the content for each is different. In the first example, Jell-O’s all about playing with the food and giving parents play ideas. In the second example, Cool Whip is oriented to those who host parties and need an easy recipe to execute. Using Facebook listening as part of your social listening strategy gives you a leg up against competitors. Not only does it improve your own marketing strategy but it also helps develop your other departments. On Facebook, customers aren’t afraid to tell you what they like or don’t like about your products. And when a competitor is failing in one area, social listening will help you step in and fill the gap faster. Remember, Facebook is just one piece of the puzzle for social listening. While the network does have the most widespread audience, your other social channels need to also be incorporated. One customer may be more vocal on Twitter than on Facebook. Ignoring the other channels will only limit your view of the data that you need.